Be the first to share your favorite memory, photo or story of JoEtta. This memorial page is dedicated for family, friends and future generations to celebrate the life of their loved one. 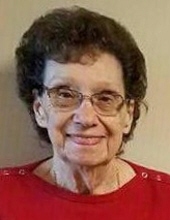 JoEtta Marie Gower, 86, of De Soto, KS passed away on January 14, 2019. Services will be held on January 18th at 11:00AM with visitation one hour prior to services at Cedar Crest Memorial Chapel, 32665 Lexington Ave., De Soto, KS. Private burial in De Soto Cemetery, De Soto, KS at a later date. Memorial contributions may be made to De Soto Methodist Church, 8760 Killcreek Rd., De Soto, KS 66018. JoEtta was born November 14, 1932 in Pomona, KS to Ray and Elberta Button where she attended Appanoose High School. She married Eugene Lewis Gower in Ottawa, KS on December 15, 1949. She lived in several states and places, following Gene through his years in the 82nd Airborne, Ft. Bragg, NC. They then moved back to Ottawa in 1954, before moving to De Soto in June 1960. JoEtta worked several years with the De Soto School District. She then worked at the De Soto Lumber Company as bookkeeper and the De Soto State Bank as a bookkeeper until her retirement in October 2002. To plant a tree in memory of JoEtta M. Gower, please visit our Tribute Store. "Email Address" would like to share the life celebration of JoEtta M. Gower. Click on the "link" to go to share a favorite memory or leave a condolence message for the family.